Metals, Semiconductors and insulators. Main properties and examples. (a) Electrical Properties Conductivity, resistivity, dielectric strength are few important electrical properties of a material. A material which offers little resistance to the passage of an electric current is said to be a good conductor of electricity. Usually resistivity of a material is quoted in the literature. Unit of resistivity is Ohm-metre. 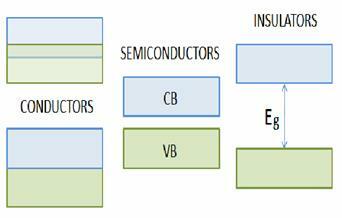 On the basis of electrical resistivity materials are divided as: (i) Conductors (ii) Semiconductors and Insulators. In general metals are good conductors. Insulators have very high resistivity. Ceramic insu­lators are most common examples and are used on automobile spark plugs, Bakelite handles for electric iron, plastic coverings on cables in domestic wiring. When a large number of metals and alloys are sufficiently cooled below transition temperature, Tc, enter the state of superconductivity in which the dc resistivity goes to zero. The estimates of the resistivity in the super-conducting phase place it at less than 4 x 10-25 W-m, which is essentially zero for all practical purposes. The highest value of Tc upto 133 K has been reached for mercury cuprate. Everybody knows that metals conduct electricity. If you apply a voltage, you get a current. Most elements are metals. However the are two other classes of materials – semiconductors and insulators. Which class a material falls into depends on how free the electrons are to move. In a metal many of the electrons are completely free. In the diagrams below, the electrons can be considered to occupied the green shaded regions, and the regions in which electrons can have enough energy to be able to move are coloured blue. This does not mean there are any electrons in the blue region. For there to be electrons free to move the blue and green regions have to overlap. They do overlap for metals, hence metals can conduct electricity – the typical resistivity of a metal is 10-8 Ώm. They don't overlap for semiconductors. Some energy may be given to the electrons so they can move from the valence band, where they normally are, to the conduction band, where they may conduct electricity. This energy may be in the form of heat or light. This implies that if you heat a semiconductor, it's resistance falls, since it can conduct electricity better. The typical resistivity of a semiconductor is 103 Ώm. For insulators there is a much larger energy gap between the conduction and valence bands. The resistance of insulators is very high. A lot of energy must be given to the electrons to push them into the conduction band. The typical resistivity of an insulator is1014 Ώm.